Can a Processor Withhold My Money? Acquiring banks and processors are like any other business; they must carefully assess risk in relation to profitability. Therefore, it’s common for a processing agreement to be terminated before the risky merchant can become a liability. When a merchant account is closed and the ability to process payment card transactions is revoked, the business will immediately be faced with several unexpected setbacks. One financial hurdle has to do with the ability to access funds. Can a Processor Hold My Money? If the acquirer terminates the merchant agreement, there is one very detrimental side effect: the bank or processor will hold a significant portion of the business’s revenue. Risk of frozen funds: just one of many consequences arising from too many chargebacks. Ask us how they can be prevented. Is that legal?! Can they do that? When will the money be returned?! Unfortunately, it is completely acceptable for the bank or processor to hold funds. And, this action really shouldn’t come as a surprise; the processor’s right to withhold money is spelled out in the merchant agreement. The merchant processing agreement generally provides the right for the bank to hold additional funds as a security deposit. This safeguards the financial institution from unplanned liability. A revenue hold will be implemented if the bank or processor believes the merchant is trending toward increased risk. The acquirer has the right to hold a merchant’s revenue as a safeguard for unexpected liability. Unfortunately, “risk” is a subjective term; it is defined differently by each processor and bank. Generally, high risk activities that generate a need for revenue holds are excessive claims of unauthorized transactions and elevated chargeback levels. 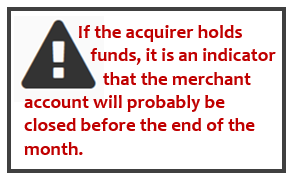 After a merchant account has been closed, the acquirer is likely to withhold a significant portion of the account funds. The amount withheld will depend on the merchant account agreement. However, merchants can expect the acquirer to retain revenue to cover at least all the open authorizations. Usually, the acquirer will freeze the merchant’s funds for several months. If recent customers file chargebacks, the bank needs to be able to reimburse those cardholders. The maximum chargeback time limit is usually 120 days. If you experience a situation where funds are being held or a regular deposit isn’t received, do not assume it was a technical glitch! Take action right away. Reach out to your account representative or the customer service department immediately. Find out what is causing the issue. If possible, speak to your risk manager to see if you can resolve the misunderstanding. You can also call an Account Executive at Chargebacks911 (877-634-9808). Even with a frozen merchant account, business is expected to carry on as normal. For example, refunds still need to be issued when customers request them, regardless of the revenue hold in place. Because additional settlements won’t be available after the processing agreement has been terminated, the merchant will need to find alternate ways to issue refunds. One way to do that is to utilize the services of e-Refunds. You can provide prompt refunds to customers, reducing the risk of chargebacks. Will a Merchant Account Reserve Withhold Your Revenue? Will Excessive Chargeback Levels Unfairly Lead to Your Business’s Demise? The co-founders of Chargebacks911® are former merchants. They’ve experienced revenue holds and a terminated processing agreement. They’ve been in your shoes. Let Chargebacks911® help you regain financial stability and turn this current nightmare into a mere bump in the road to success.